Construction is well underway and on time and budget to be complete by winter 2013! The building will be a 108 bed homeless shelter for men with mental illnesses, and construction is 50 percent completed and on schedule to open in Fall 2013. 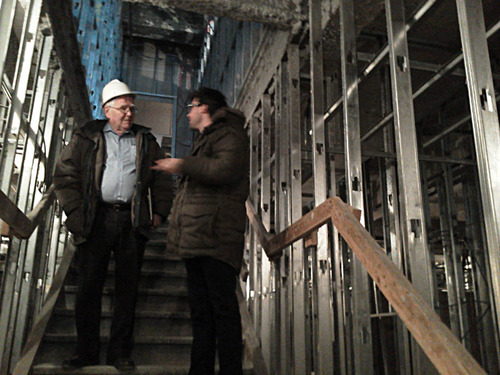 Director of Facilities Ernie Talbot with Philip Jenkin, architect. Linda Cunningham, an artist who lives and works in the Bronx, was selected to build a decorative wrought-iron grille for the front façade of the building. It will screen the outdoor front entryway space from the street, and provide color and texture to the front façade. The grille is currently being fabricated by Linda and her team of student assistants, who are bending very long, 2” wide bars of steel into curved, organic shapes to look like blades of grass. These curved bars will then be welded to rectangular frames to create four panels. 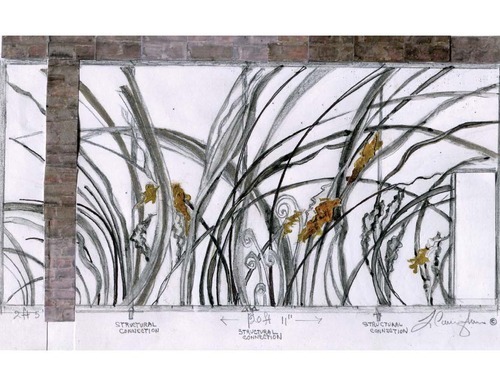 The panels will interlock when they are installed at the front of the building, and the resulting work of art will span around 23 feet. The ironwork will blend in nicely with the brick and stone façade, and the grille will last many decades because of the durable wrought-iron construction. The grille will also define a welcoming border space by the front door for those going in and out of the shelter, defining the outer edge of a patio area with comfortable wood benches and a view to the street.